If there was one excuse I have heard more than any other, it is that there isn’t enough time. Let’s talk about wat it means and how to fix it. As always we are here to write more and better with the help of a writer and editor. 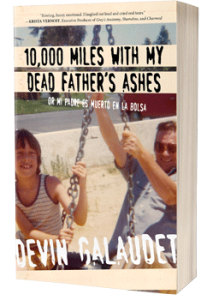 I will also describe from top to bottom what I am doing to promote my memoir, 10,000 Miles with my Dead Father’s Ashes. For more visit devingalaudet.com/dad and sign up to win free stuff and learn about how to get more free stuff when you buy my book.